The smallest decisions usually drive me absolutely mad. I think I like one thing until I see other options, which leads me to second guess every decision I’ve ever made…ever. It took me days to choose a paper towel holder. Am I alone here? Choosing a front door color seems like one of those no-brainer decisions, but boy is it a big one! It can scream your personality to all your neighbors and street stragglers. Color emotes different feelings. 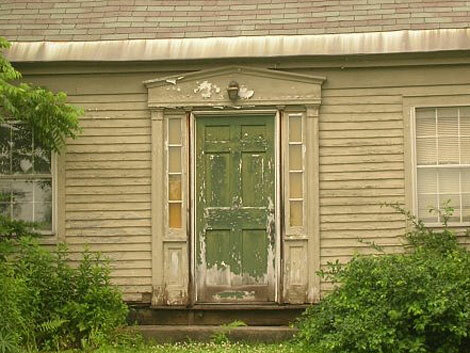 It’s basic psychology, so what does your front door say about you? Are you warm and welcoming? Each style has amazing character, and honestly, I can see myself choosing each one in the right time and house (except the last one, of course). An unexpected shade can really set the tone for the vibe your guest should expect when entering your home. When choosing a front door color, you need to consider two things: your personal style and the style of home you’re living in. When the two collide, it’s a beautiful thing. We live in a classic brick ranch, yet I love blue doors. I keep telling myself that blue doors are just a trend, and they will date a home in ten years. I don’t want to believe my own theory though because I adore blue doors. In my personal opinion, it takes the perfect shade of blue to look good on a red brick ranch. For the most flawless blue door against a red brick ranch, the blue needs to have gray undertones, whether dark or light blue. Try Benjamin Moore Stratton Blue or Midnight Navy. All in all, you just can’t beat a soft, enchanting blue on a white brick house…sigh! On the other hand, I love a classic red door against red brick, but this can be tricky as well. You need to not only consider the color of your brick, but choose one of the one million shades of red. Why is life so hard? #firstworldproblems. Our house has warm, brown undertones to the red brick and black shutters, so I knew a warm, terracotta red with a bit of brightness would do the trick. After many hours and a wrong first selection, I chose Morocco Red by Behr. So here’s how you master the front door phenomenon! Consider the style of your home: traditional, tudor, ranch, craftsman, etc. Choose a color that highlights the style and goes well either the exterior colors. Then throw your personal touch on the shade and undertone. Like my example above, I feel like red doors look classic on red brick ranches, so I went with a shade that suited my style and fit well with the exterior colors as well. Front door dilemma solved! Like with all parts of design, rules are meant to be broken. A bright yellow door on traditional home can look absolutely stunning, so you can just take my silly little theories and throw it out the door. It’s your home. Choose what makes you happy. Make it yours. And at the end of the day, it’s only paint.